I want to send a shout out to John Overall of WordPress Plugins A to Z for sharing posts from BlogAid and mentioning me on his super podcast. If you find Tips Tuesday helpful, please do share it with your peeps, Like us on Facebook, YouTube, Twitter, Pinterest, LinkedIn or wherever you hang out the most. And speaking of, did you know that BlogAid has an all new account and boards on Pinterest? So if you followed my personal account there, be sure to Pin the new BlogAid boards, as those are being constantly updated. Thanks to everyone who attended the webinar live last week. I sent out an email Sunday night reminding everyone that the replay is only available until midnight tonight. So, do take the opportunity to watch. It really warms my heart to have record setting registrations for this webinar because it tells me that more and more site owners are getting serious about their success. And thanks to everyone who sent me a note to say how eye-opening it was for you. I sure hope you take action on all these things sooner rather than later too. But at least now you know about them. Speaking of HTTPS, I’ll have another free webinar on it coming up later this month. BlogAid News subscribers will be the first to know and get dibs on registration for it. And, all who register will get a fresh copy of my HTTPS Pre-Conversion Checklist too. I’ve been updating it quite a bit since the last webinar with all the gotchas me and my webmasters are finding. So, watch for an announcement on when that webinar registration opens up. The folks in my SEO Workshop are asking a bunch of great questions and requested more info on links as they relate to SEO. It’s been a few years since I’ve written comprehensive posts on those topics, and Google has changed a lot too. So, I have a new series of posts for everyone to enjoy. Follow and NoFollow Links and SEO is all about the proper use of those link attributes and how they impact SEO, plus the changes Google has made with regard to them. So, even if you’re already in habits with using those directives, you may want to give it a fresh read. Control How Google Crawls and Indexes Your Site Pages is all about how to give Google and other search engine bots directives about how to treat your site pages with regard to crawls and indexing. Plus, I included info on how to keep pages out of your XML sitemap too so they can’t be found that way either if you really want to hide them from search. On Wednesday, barring any other major news, I’ll have another in-depth post for you on redirects including how to and how not to use them, plus lots of great tips. So be on the lookout for that one too. When you subscribe to BlogAid News there’s a little checkbox on to subscribe to all of my posts by email as well. That way you never miss breaking news, event announcements like free webinars, and helpful tips like these in-depth posts. 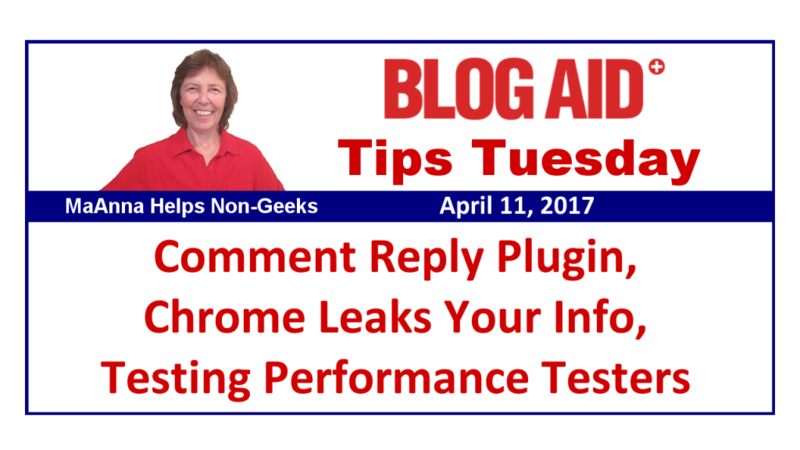 Did you see my post on Saturday about the Chrome browser leaking your street address and even credit card info in forms you fill out online? On phishing sites, you could just be entering your email address to get a free gift and hidden fields you can’t see are getting populated with all that personal info without your knowledge. Do go read that post and see how to manage the autofill feature in Chrome on desktop and on Android. And please share that post with everyone you know to help protect them too. Which plugin do you use to notify commenters on your blog that a reply has been left? ReplyMe has been an old standby, but it has not been updated in years. Several of my clients have tried the Comment Hacks plugin by Yoast, but it blocks too many real commenters. I sure would like to find a better one to recommend. Please do leave a comment here on the blog or anywhere you see this post on social media, and thanks in advance. Work presses on for updates to WP 4.7.4. These are mainly bug scrubs. And, devs continue to work on the new Editor feature plugin. That’s the way they test new features now before adding them to the core WP code. Anyone can install and test the plugin and report bugs or make improvement suggestions, which is a big help to them. I wouldn’t do that on a live production site, though. You may recall last week I mentioned a new features plugin for an image widget, which will be really helpful and I look forward to that being introduced in the core for everyone to use. I’ll have more for you on that, and a video tour, as they begin to finalize it. As the devs are working on the new features that will be included in the new Editor for creating posts and pages, they took a survey to see what folks want. The replies were heavily dominated by devs, which doesn’t really give a true representation of most bloggers. I was surprised by some of the replies. Distraction Free Writing Mode – hardly anyone uses it. Never Use Features – I was dismayed to see that most devs never use the font color tool. But then, devs aren’t known for making things pretty. I sure hope to heck they don’t remove that feature based on these responses. I believe most bloggers do use that feature based on the outcry when the color picker was removed. In fact, most everything on that list are tools I use all the time. So, I hope they don’t remove any of them. You’ll want to go have a look at the full survey results yourself and see the comments that were left about each item too. Let’s hope the WP devs make changes we like. You may recall in a previous Tips Tuesday that I reported that version 4.5 of the Yoast SEO plugin now includes a nag if you’re not running PHP7. I didn’t care for it being in an SEO plugin, but did acquiesce that it would have the desired effect of making more folks aware that they need to upgrade. Well, looks like it is working. The folks at WPTavern report that it has resulted in a significant increase in folks upgrading to PHP7. That was at the top of our topic list in The Future of WordPress Site Ownership webinar too. So, do get it on your radar to do soon. Your About page is not about you. I know that comes as a shock to most site owners. But honestly, your site visitors care more about what you can do for them than they care about you. It’s a sales page and has a purpose, just like all of the rest of the pages on your site. What’s different about your About page is that it gives you an unique opportunity to connect with your audience on a more personal level. My friend and fellow webmaster, Ingrid Cliff of Heart Harmony Communications has a delicious post for you to read about what to include on your About page. I’ll be taking many of these suggestions as I rewrite mine too. She also suggested that I put a video on it. Duh!!! Why didn’t I think of that? Talk about a great way to personally connect with my peeps! The folks at WPExplorer did a test to benchmark popular online performance testers. I can’t say that I agree with their assessment. In fact, their own graphs show how out of line Pingdom is with every other tester, yet they consider it to be the most accurate. What I have discovered from years of doing site audits is that the performance testers only tell part of the story. Audits are a big puzzle of clues that have to be put together to find all the sources of performance drags on a site. Online performance tester results are the last thing I gather in an audit. I’ve already found the problems. Those tests just help us confirm how much damage is being done and zero in on a few of the resource hogs. The real problem with online testers is that most DIY site owners don’t know how to configure them to get real-world results. And they only pay attention to the scores, not what goes into making them up. That’s why I have a 2 hour, non-geek chat with site audit clients to go over the 30 page report I generate. They see the problems as clearly as I do and then they can make good decisions for themselves about what can stay or go on their sites to make it faster. If you only use Pingdom, as the folks at WPExplorer suggest, you’ll think you don’t have any issues and nothing needs to be improved. So, be sure you know how to run these tests and interpret the results, and that they are not the only source of info you’re gathering to find the performance drags on your site. I find most of them in the hosting account checks where I go deeper than what you can see from within WordPress. I can’t believe I didn’t think of that Ingrid!!!! Thanks for the tip. Thanks Diane. Like ReplyMe, it is still working, but hasn’t been updated in 7 years. As we continue to move to PHP7 and the WP core updates, especially for security, I’m concerned about using these old plugins. I’ve been getting internal server errors using the Comment Reply Notification plugin since upgrading to PHP 7. I found a discussion on the plugin page about it not being compatible with PHP 7. The response was: “If you’ve got a code editor, just replace all the instances of mysql_escape_string() with mysqli_real_escape_string.” The individual also said they’d post an update on GitHub. It appears that was done, but I have no idea if that’s a good place to get plugins or how to do so. I also read a discussion about coding one’s own Comment Reply Notification. I’m not sure if any of these are reasonable options, but I wanted to share what I had read thus far. Thanks for letting us know that the Comment Reply Notification plugin is not yet compatible with PHP 7. Yes, you can get plugins from GitHub, in fact, that’s where all the new coding happens before a general update comes through. However, it does cause confusion sometimes, as the regular plugin update notices will still appear too. So, I generally don’t recommend it for most site owners. I’m testing new comment reply plugins and have found a HUGE caveat in them. Will have a report as soon as I finish the testing.